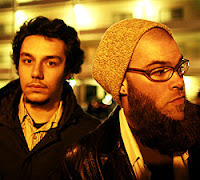 My cousin(in-law)'s hip-hop group Common Market is the Artist of the Day today on www.spin.com. Be sure to check out the page before the end of the day. These guys tore it up at Neumos in Seattle the other night. Be sure to catch them live. "Take a deep breath. I request a requiem for apathy/Momentarily lost hope but now it's back in me."